We’d love your help. Let us know what’s wrong with this preview of Emmeline Pankhurst by Lisbeth Kaiser. This board book version of Emmeline Pankhurst—an international bestseller in the critically acclaimed Little People, BIG DREAMS series—introduces the youngest dreamers to this pioneering activist for women's rights. As a child, Emmeline Pankhurst was inspired by books about heroes who fought for others. She dedicated her life to fighting for women's voting rights and, with This board book version of Emmeline Pankhurst—an international bestseller in the critically acclaimed Little People, BIG DREAMS series—introduces the youngest dreamers to this pioneering activist for women's rights. As a child, Emmeline Pankhurst was inspired by books about heroes who fought for others. She dedicated her life to fighting for women's voting rights and, with hard work and great bravery, led a remarkable movement that changed the world. Babies and toddlers will love to snuggle as you read to them the engaging story of this heroic activist, and will also enjoy exploring the stylish and quirky illustrations of this sturdy board book on their own. To ask other readers questions about Emmeline Pankhurst, please sign up. When I was little, my mother said: 'You MUSTalways vote, women DIED for your right to vote'. Only later did I find out who these great women were who fought for the rights we often take for granted. This is my second book of the series 'Little people, big dreams' and I found it both inspiring and engaging. The story of Emmeline Pankhurst's life is told in simple sentences, so it can be read to very young children. I also loved the artwork in this book. The page which tells the young reader about When I was little, my mother said: 'You MUSTalways vote, women DIED for your right to vote'. Only later did I find out who these great women were who fought for the rights we often take for granted. This is my second book of the series 'Little people, big dreams' and I found it both inspiring and engaging. The story of Emmeline Pankhurst's life is told in simple sentences, so it can be read to very young children. I also loved the artwork in this book. The page which tells the young reader about the time when Emmeline lost her husband is black which I felt perfectly renders her feelings of grief and sorrow. There must be thousands of books written about Emmeline Pankhurst, but I believe it is never too early to learn about this amazing woman whose hard work and courage changed the way whole societies operate. This is the second book that I've read from Lisbeth Kaiser's Little People, Big Dreams series. I never knew who Emmeline Pankhurst is, but because of this book, I learned a lot from this amazing and one of the notable women during the early 20th century in England. I commend everyone for the publication of this book series because they are both informative and inspirational not only to the young readers but also to adult readers. This book series is a really great way to show kids what important people did in the past. Emmeline Pankhurst fought for women rights and became a hero in the end. The drawings were beautiful and the text was on point. I was aware of the series for a while but hadn't read any of them until I picked up Good Night Stories for Rebel Girls: 100 Tales of Extraordinary Women and was inspired by stories of important women around the world. I thought this book was a great place to start in the series, given the hugely influential woman it represents. This is the story of British activist Emmeline Pankhurst, leader of the British suffragette movement who helped women win the right to vote. Pankhurst's work helped to sha I was aware of the series for a while but hadn't read any of them until I picked up Good Night Stories for Rebel Girls: 100 Tales of Extraordinary Women and was inspired by stories of important women around the world. I thought this book was a great place to start in the series, given the hugely influential woman it represents. This is the story of British activist Emmeline Pankhurst, leader of the British suffragette movement who helped women win the right to vote. Pankhurst's work helped to shape the idea of women for our future and her work is recognised as a crucial element in achieving women's suffrage in the United Kingdom. As is the gist with all of the stories in this series, Pankhurst achieved incredible things as an adult but began life as a child with a dream. This book provides a brief biography and insight into her childhood and life as an a political activist. While simple in its idea, this book provides a creative and insightful look at Pankhurst and is an inspirational read for both adults and young children. 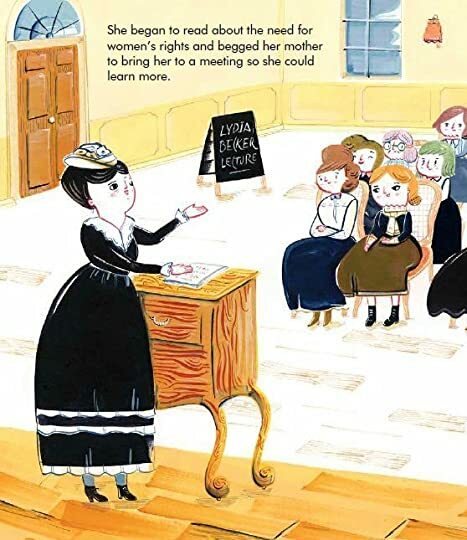 I especially enjoy how it is presented; it is visually so fun and cute, appealing to young minds who now have opportunity to read about important female figures in history. This series is always a joy to read, it’s a really nice introduction to well known people for little children. Of course the plot is always a little bit fast but that’s to be expected and it’s totally understandable. This little book talks about the the suffragettes and their fight to get the vote for women and also other rights that were previously denied to them. I would have loved to read someth A copy of this book was provided by the publisher via NetGalley in exchange for an honest review. The ‘My First Little People, Big Dreams’ series provides informative and inspirational biographies about people who left a mark on this earth, no matter what difficulties they have encountered. These stories are very short, but that’s because they’re books for children, so it’s totally understandable. I think they are a very smart and wonderful way to introduce little children to such important figure The ARC of this book was provided by the publisher via NetGalley in exchange for an honest review. I think they are a very smart and wonderful way to introduce little children to such important figures. "Emmeline had become what no one thought a girl could be: a hero"
Lovely, and important addition to this series. I get these for my niece and we adore looking through them and learning about the lives of these incredible women. A more familiar story for me growing up in the UK. Emmeline Pankhurst did a great deal for women's sufferage and poorer families in industrial towns and cities. Born at a time when girls became wives first and mothers second she was inspired as a child and through her marriage to live and act differently. As she was moved, this series, Little People, BIG DREAMS hopes that the young children listening to these stories will be equally aware of their own potential, to dream dreams and realise their p A more familiar story for me growing up in the UK. As she was moved, this series, Little People, BIG DREAMS hopes that the young children listening to these stories will be equally aware of their own potential, to dream dreams and realise their potential. so a basic biography with intriguing illustrations for further questions and simple sentences pitches in with the start of understanding our world and your place init for children to learn and embrace. I have vague memories of David Livingstone and Elishabeth Fry from my early reading and being read to by adults. Parents and carers should welcome books that lift ones eyes beyond the nursery. I love that this series exists. This is such a good way to introduce famous women to children of the picture book level. So far I have read this one as well as the one on Rosa Parks. What is good about this series is the concepts are very simple. This one, for example, doesn't go into hunger strikes, and force feeding, and being thrown in prison. This just lays out Pankhurst's fight for voting rights for women in the UK. Another charming addition to the Little people BIG DREAMS series. This time it’s Emmeline Pankhurst and her fight for women’s rights and the Suffragette movement. With a lovely flowing text and charming illustrations this will be loved by children and adults alike. Educational too and inspiring. I actually didn't know anything about Emmeline Pankhurst (or even who she was) prior to reading this children's book. It was informative- I thought it was the perfect amount of detail about women's suffrage for a child- and the drawings went well with the information. The biographical information here feels rather too concise, and is written very simplistically. The illustrations though, with a charming vintage feel to them, are the triumph of the book. אמלין פנקהרסט הנהיגה בבריטניה; יחד עם בנותיה; את תנועת הסופרג'יסטיות המרשימה שחוללה מהפכה עולמית. "אנחנו צריכות לשחרר חצי מהמין האנושי - את הנשים, כדי שהם יוכלו לשחרר את החצי השני." - אמלין פנקהרסט. In the 100th year of women gaining the vote in the UK, this book is ideal for introducing young people to one of the leading names in that struggle. As a book in a school library or classroom, available for project work or a book borrowed from a library by an active parent, this book gives the background without being too over the top with the politics, allowing curious minds to question and discussions about equality and rights to follow. While wandering around Barnes and Noble, I stumbled across this awesome new board book series for babies and toddlers. The vibrant, yet simple, covers displaying historical women that I have grown up learning caught my eye, and it instantly drew me to pick up a few of these books off the shelves. To be totally honest, I was so intrigued by these books that I ended up sitting right down in the aisle of the store to explore this new nonfiction board book series. My husband and daughter must have been embarrassed to be near me while I was sprawled out on the floor of Barnes and Noble reading board books designed for little ones because they ditched me and left me alone to dig into this new series! Through my reading and my post-reading research, I have learned that Little People, Big Dreams is a new series that focuses on introducing the youngest of readers to amazing, wonderful women that have influenced the world. Each book is purposely designed in order to highlight one woman who has made a difference in the world. It tells the story of that women's dream and how she was able to make her dream come true despite the biggest of obstacles. I loved the simplicity of the design of the series, Little People, Big Dreams. The authors and illustrators who have worked on this project clearly understand their audience, and they have made each of the books reflect exactly what they want their youngest of readers to be exposed to. Designed for babies and toddlers, Little People, Big Dreams uses simple text and engaging pictures to tell the story of each woman in a kid-friendly manner. Often times, my biggest complaint with board books is that they lack plots or messages. Even though board books are purposely designed for babies and toddlers, I absolutely believe they still need to be strong examples of books that contain both strong plots and messages. All age levels of children need to have access to great text. 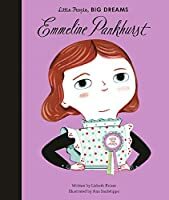 Emmeline Pankhurst is book in the Little People, Big Dreams series and is a children's picture book written by Lisbeth Kaiser and illustrated by Ana Sanfelippo. It is a cursory biography of Emmeline Pankhurst from her childhood in Manchester, England to her becoming an icon in the Women's Rights Movement. March, at least in my part of the world is Women's History Month, which I plan to read one children's book, particularly a biography, which pertains to the subject everyday this month. 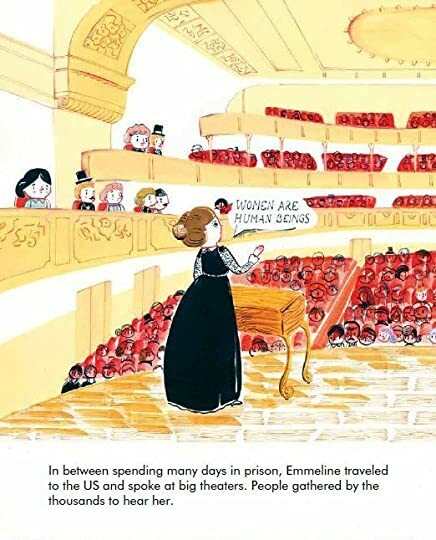 Therefore Emmeline Pankhurst is book in the Little People, Big Dreams series and is a children's picture book written by Lisbeth Kaiser and illustrated by Ana Sanfelippo. It is a cursory biography of Emmeline Pankhurst from her childhood in Manchester, England to her becoming an icon in the Women's Rights Movement. March, at least in my part of the world is Women's History Month, which I plan to read one children's book, particularly a biography, which pertains to the subject everyday this month. Therefore, I thought that this book would be apropos for today. Emmeline Pankhurst (née Goulden) was a British political activist and helper of the British suffragette movement who helped women win the right to vote. She was widely criticized for her militant tactics, and historians disagree about their effectiveness, but her work is recognized as a crucial element in achieving women's suffrage in the United Kingdom. Kaiser's text is rather simplistic, straightforward, and informative. It starts off with a young Emmeline Pankhurst growing up with her large family in Manchester with her parents and many siblings and follows her life as she become a women’s rights icon as she was successful in giving women the right to vote. At the end, there is a concise and informative biography timeline of Emmeline Pankhurst's life. Sanfelippo's illustrations are drawn well, albeit a tad simplistic, but depicted the narrative rather well and apropos to the target audience. The premise of the book is rather straightforward. It depicts Emmeline Pankhurst's childhood in Manchester during a time when women were viewed as subservient. At a young age, she loved heroic stories and in adulthood became one of those heroes that protected and fought for the disenfranchised – in this case – women. Originally published on my blog: Nonstop Reader. 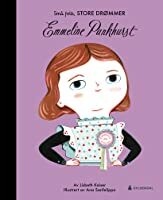 My First Emmeline Pankhurst is a simplified version of the Emmeline Pankhurst book in the Little People, Big Dreams series. This series of young reader books provides short illustrated biographies for famous people around the world from current and past history. They're all really well done and I've enjoyed (and recommended) all I've reviewed on my blog. Worth noting: There are two versions of this book. The young reader version was released in 20 Originally published on my blog: Nonstop Reader. Worth noting: There are two versions of this book. The young reader version was released in 2017. This boardbook edition has much more simplified text and was released 5th Feb 2019. The entire series is published by Quarto on their Frances Lincoln imprint. The art by Ana Sanfelippo is appealingly naive and simple and supports and illustrates the story very well. I'm impressed with Quarto's expertise in finding and presenting the artists of this series to a new audience. Really well done series and this entry is a worthy addition. Would make a superlative reading circle selection for classroom, library read-along, bedtime story, or similar. I personally recommend the entire series as good choices for school/classroom libraries. This book was about Emmeline Pankhurst and her journey for woman's rights to vote. this book starts off by explaining the "problem" that she is facing. that woman are not treated fairly and are viewed as "lessser" people then men. it goes through her journey of hardships that she has to face for getting woman the right to vote and all the work that she has to put in to be able to do that. I liked this book for many reasons. one it was a story that i have never heard before in this kind of way. a This book was about Emmeline Pankhurst and her journey for woman's rights to vote. this book starts off by explaining the "problem" that she is facing. that woman are not treated fairly and are viewed as "lessser" people then men. it goes through her journey of hardships that she has to face for getting woman the right to vote and all the work that she has to put in to be able to do that. I liked this book for many reasons. one it was a story that i have never heard before in this kind of way. and two it shows that woman can do anything if they set their mind to something they want. 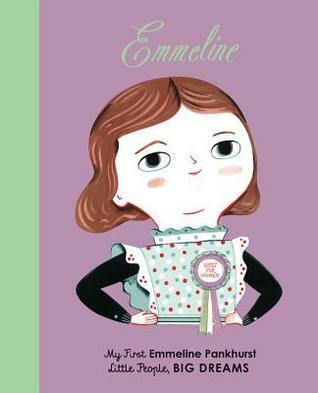 'Emmeline Pankhurst: My First Emmeline Pankhurst' by Lisbeth Kaiser with illustrations by Ana Sanfelippo is a board book adaptation of the life of a British suffragette. Emmeline Pankhurst was born in England to a family that helped other people. She wanted to go to college or get a job, but her parents wouldn't let her. Instead, she fought to help women get the vote and the change the way things were. I liked the illustrations by Ana Sanfelippo in this book. 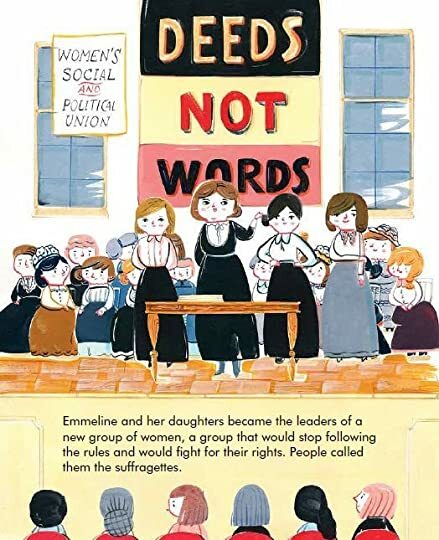 The colors are bright enough without d 'Emmeline Pankhurst: My First Emmeline Pankhurst' by Lisbeth Kaiser with illustrations by Ana Sanfelippo is a board book adaptation of the life of a British suffragette. I liked the illustrations by Ana Sanfelippo in this book. The colors are bright enough without detracting from the story. The story itself is simple enough for the young to understand. I continue to be impressed by this series. I am a big fans of 'little people, BIG DREAMS' series. the illustrations perfectly captured beautiful stories. Emmeline's suffragette not only fights for women's voting rights but also took responsibility to help country during worldwar. They proved that women also capable as men at works. After read this book, i knew how long fight and endeavour to pursue the right to vote for women. The rights that I take for granted. I'm sorry to say that I did not know much about Emmeline Pankhurst until I watched the movie "Suffragette" with Carey Mulligan. The movie features the women's suffrage movement in Britain and Emmeline Pankhurst was instrumental in that movement. I was delighted to see a children's book written about her life and experiences. The text is inspiring and the illustrations are beautiful; highly recommended. This lady is not as famous as most in this series. I didn’t know who she was, and it takes to about halfway through the book to be told she was a suffragette. “Deeds, not words.” One of my favorite sayings. This one’s a little better than some of the recent ones, but still light on facts and structure. A return to the style and substance of the first few volumes would be welcome. Besides being a gorgeous book, this opened up so many conversations with my children about women’s rights. My son seeing a man, Emmeline’s husband, fight for women’s rights makes this book 100x more worth it. It’s beautiful and the true story opens up conversations with children. More than 5 stars in my opinion. I adore the books from this collection! The art is beautiful, and the lives of these influential figures are condensed in a kid-friendly way. They are fun to read and teach children about some amazing role models that made huge impacts on our lives. I voluntarily read and received a free ARC copy of this title through NetGalley in exchange for a review. All thoughts and opinions are my own.